Gràcia is a railway station located under Plaça de Gal·la Placídia in the Gràcia district of Barcelona. It is served both by lines L6 and L7 of the Barcelona Metro, and by lines S1, S2, S5 and S55 of the Metro del Vallès commuter rail system. All these lines are operated by Ferrocarrils de la Generalitat de Catalunya, who also run the station. The station is also expected to become part of L8 in the future with the planned extension of that line from Espanya metro station, and would become a junction station for the three FGC Barcelona Metro lines in operation in the city. 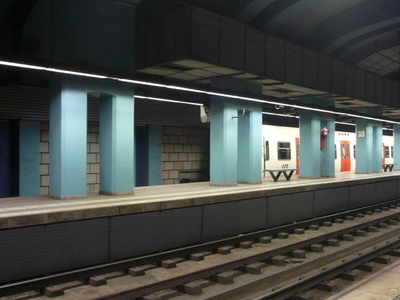 Gràcia station should not be confused with Passeig de Gràcia station, which is located some 1.7 kilometres (1.1 mi) away on metro lines L2, L3 and L4, and various Rodalies de Catalunya suburban lines. The station is currently undergoing major renovations. The main concourse is completely rebuilt and its size is drastically increased. Furthermore, the actually narrow two island platforms are enlarged and new stairways, escalators and elevators are installed. In the future, the station will have only 3 tracks, the two main central tracks, plus one track for the L7 trains heading to Avinguda Tibidabo. The currently existing track for the L7 trains heading to Plaça Catalunya will be removed and replaced by the enlarged platform. Here's the our members favorite photos of "Metro Stations in Barcelona". Upload your photo of Gràcia Station!